I almost feel silly posting this here, since it is such a simple recipe, but honestly, this sandwich is my favorite and is something I make so often, that I figured I might as well put it up. People have asked me to also include some easier recipes, and this is definitely that. It is my go-to sandwich because I can make it very quickly and tastes terrific. I first came up with this sandwich idea because I had purchased some Camembert cheese (one of my absolute favorites) from the cheese counter at my local grocery store, since it is much cheaper for me to buy it per pound there than packaged in the refrigerator aisle. I stocked up and got a decent amount (at least a few servings worth) and put some in my freezer for another day. I didn't realize that my freezing it would completely change its texture from something I considered delectable to something rather off putting- crumbly and not creamy at all. Trying to figure out solutions for what to do with it, I attempted to make it into a melted cheese sandwich and it was terrific. However, I feel guilty eating a carby sandwich (bad enough that it's not Paleo), so I wanted to "healthy it up" by adding some vegetables, and since I have an abundance of greens in my garden, I added that and a slice of raw onion. It was great, but I improved it more by spreading dijon mustard on the bread in future times. After adding that, I toast it in my sandwich maker (ok, confession, it's actually my old broken waffle maker, but a sandwich maker, panini press, or a George Foreman grill would work just as well) and then devour it. Since I made it the first few times, I've tried it with a variety of different cheeses. The types of cheeses that don't bother my stomach are the various aged cheeses, so I used those for sandwiches- blue cheese, brie, cheddar, Parmesan, etc... and they all are amazing. I mainly use my beta vulgaris maritima, sea beet, aka wild swiss chard, in my sandwiches, but also do it with beet leaves, lambsquarters, mallow, spinach, or any other non bitter greens I can get my hands on. 2. Spread one side with dijon mustard. 3. Slice your cheese thinly, and put it between your bread. 3. Chop up your greens if using large ones, then stuff them in the sandwich. I have tried making this sandwich with the greens whole, but it ends up being hard to chew the sandwich, so chop them up. 4. Slice onion thinly and add that. I usually add as many onion slices as I can fit in my roll while still having my cheese and my greens there, which doesn't end up being so much, to be honest. 5. 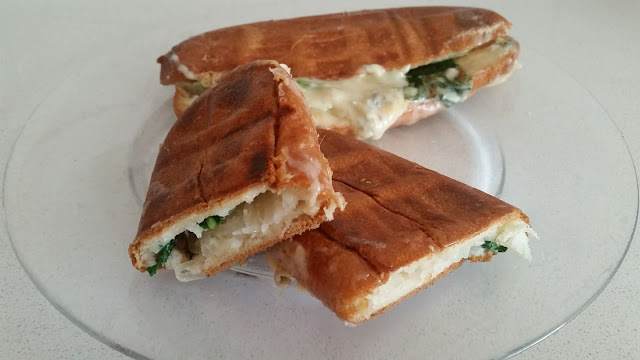 Toast in a sandwich maker/panini press, etc... until your bread is toasted, the cheese is melted, the greens are cooked, and the onions are somewhat cooked. Listen, I can't promise you'll love these, but to me, these are the definition of the perfect sandwich, heavenly, delicious, easy, frugal (since they don't have so much cheese in them, otherwise the cheese starts spilling out the sides when toasted, so it ends up stretching the cheese further. Basically, just ultra awesome, and I can't get enough of them. Are you a sandwich fan? What is your favorite type of sandwich? Does this look like something you'd try out? Grilled cheese with Camembert; I'll have to try it. I love the idea of greens in the sandwich but it won't fly with my husband. More for me! I've made panini sandwiches in my waffle maker too. What else do you cook in there? I love a good grilled cheese sandwich. Thanks for sharing yours. My favorite is turkey & Swiss with a slice of tomato and Dijon in a croissant. I like to make them ahead of time and heat them in the microwave for about 30 seconds. Now that I'm calorie counting, croissants aren't my go to anymore. Heck, bread is mostly off my list. I'm glad you mentioned that you press your sandwich, I forgot I can do that instead of butter in a frying pan. Thanks!